You may think that this article is unnecessary because there is a portrait dating from 1509, the year he turned 18 and came to the English throne. This portrait is lovely yet, to me, there are problems with it. First of all is that it shows what appears to be a receding chin. No other portrait of him has this feature despite quite a large number surviving. I think that this portrait shows his chin as receding because there is a problem with the angle of the far side of Henry’s face (the left hand side of the portrait as you look at it). The far side seems to have him leaning slightly forward whilst the near side of his face shows him standing completely upright. This erroneous mix of angles of the face leads to a misleading ‘receding chin’ effect. His hair in this portrait is also problematic. Age, and degradation of the pigments used, have led to the him looking as if he has a frizzy brown bush of hair. It is known that Henry was ‘ginger’, and the Joos Van Cleve portrait (c 1535 – see below) confirms this so, colourwise, he probably had hair colour somewhere on a strawberry blonde, through deep coppery gold tones, to a chestnut auburn tones spectrum when he was in his teens. Henry may have ended up bald but, as he was in his teens when he succeeded to the throne, he would have had a good thick head of hair in his teens and even in his early twenties (as did our current Prince William). The colour would calm down slightly as he got older and his hair may well have got thinner generally as well as losing it altogether on top. Our current Prince Harry (actually baptised Henry) shows the progression of ginger hair tones as you get older. Pictures of Prince Harry in his teens show that his hair colour is quite vibrant. The colour is still strong, now he’s in his thirties, but not quite as brightly vivid as in his teens. My personal experience, which is also shown by modern ginger haired celebrities (that don’t dye their hair), is that when ginger people or red heads get old enough to lose their hair colour, they actually lose most of the red shades first leaving a fairer, almost blonde colour initially. Later the white hairs start to crowd into the hair and lighten it even further. This can lead to a “salt and pepper” effect until the hair is totally white. Only people who have brown or darker hair, to start with, end up as grey when they’re older. The ambassador’s description, and the miniature, would suggest he definitely didn’t have frizzy hair but I would suggest that the phrase the ambassador used – “combed straight” – might suggest that Henry had naturally wavy to curly hair at a time when it wasn’t fashionable so he tried to minimize this. The later portraits are not helpful in defining his natural hair state as they normally show his hair being so short that any curls or waves would have been cut off. Caucasian hair has to have a little length before any waves or curls can show. I think there is some support though for Henry not having straight hair if the portrait of Henry VII and his family (including grown versions of the children who died young), with George and the dragon, is any indication. 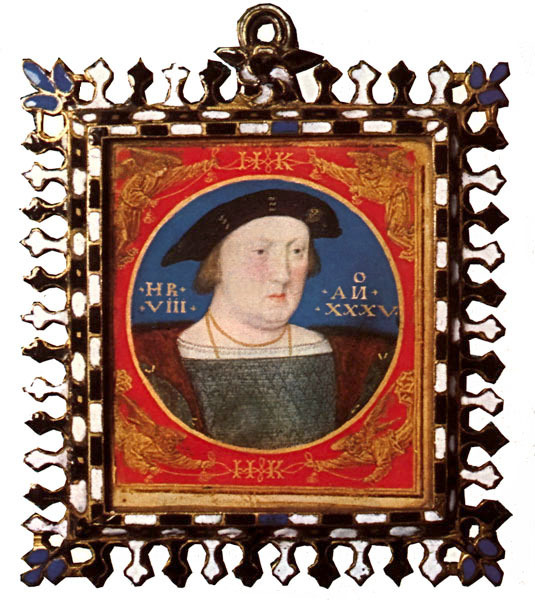 This portrait dates from late in the reign of Henry VII. Below is one section, cropped from this Henry VII family portrait. 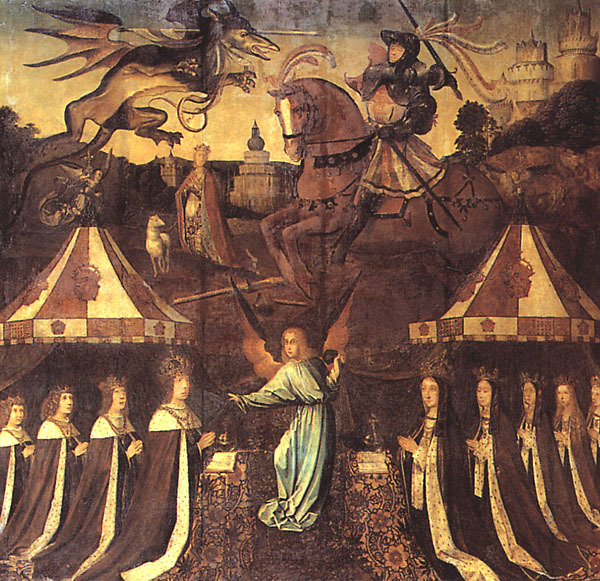 It shows Henry VII with Arthur, his eldest son, behind him and Henry, his second son, behind Arthur. Cropped out, and behind Henry, is also a grown version of Edmund, Henry VII’s youngest son who actually died at a year old. Henry VIII (to be) has an amazing head of curly hair in this portrait – though it has to be said that the portrayal of Henry VII doesn’t look so good so the overall accuracy of the portrait is not certain. The fine Torrigiano bust of his father, Henry VII, shows definitely wavy hair which Henry may have inherited (this can be seen at http://tudorhistory.org/henry7/henry7bust.jpg). I found a few other points of concern in the 1509 portrait too. Henry VIII’s eyes are flatteringly large yet we know Henry’s weren’t that big from his other portraits. The National Portrait Gallery talks of him having “small eyes and mouth with a long,narrow nose”. Also the point on his back, where his neck joins his torso, is a bit too like a ski slope to be an accurate portrayal of the back of the neck of a healthy young man. The 1509 portrait confusingly shows him with very slim fingers and with the hint of a double chin, but under the middle of the jaw and not directly under the chin. This all led me to mistrust the way he is shown in the 1509 portrait. But this is bound to raise questions as these portraits do not seem to immediately lead onto the most famous portrait of Henry VIII: the one from the Whitehall mural and all those derived from that afterwards. In that his face appears rounder and the nose squatter and broader. However it should be noted that Holbein’s original was destroyed in the 17th century in a fire and the 1537 portrait of Henry, now in Madrid, is the only surviving original definitely made by Hans Holbein the younger himself (that I am aware of). From 1520 to 1535 (the National Portrait Gallery 1520 portrait, the Horenbout miniatures and the Van Cleve portrait) show a fairly consistent image of Henry (even if he is also to be seen slowly gaining a little weight as time goes on). However there are then some changes to his appearance, which appear over quite a short period from 1535 to 1540. The difference between the 1537 Holbein portrait and the 1535 Van Cleve portrait are not huge. In the later portrait Henry has less hair or has had it cut even shorter. Henry is carrying more weight too in the later portrait, especially on his lower face and neck for some reason. 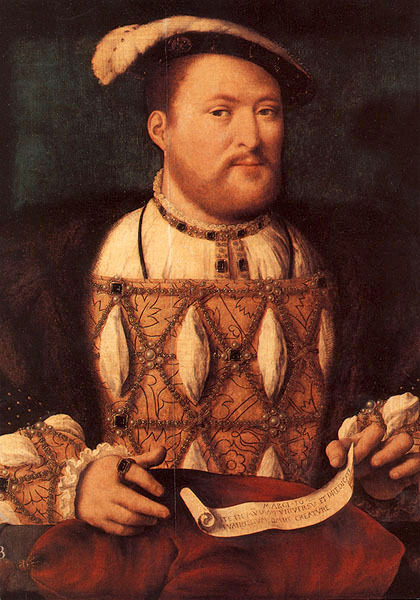 Although he is not as big as he will get, it shows (without making it too obvious) that Henry effectively has very little neck at all at in 1537. This is partly disguised as his beard hides the likely double or triple chin and he has changed the style of his undershirt. Instead of a gathered neckline sitting at the bottom of his neck, the undershirt in Holbein’s portrait is high-necked, swooping down from almost under the ears towards the front of his body following the jaw line, but even then a bulge of fat in Henry’s neck can be seen above the undershirt by his ear. Rather than a slim jewelled line of embroidery, which sat around the bottom of his neck in the Van Cleve portrait, there is a section of almost flesh coloured lace around his actual neck, in the Holbein portrait which hides the true shape of his neck. In one sense a fairly big weight gain isn’t surprising as this is after his serious 1536 jousting accident. Henry was getting older too so his metabolism would be slowing down plus he couldn’t exercise as much or as intensely as he had once done. But instead of reducing his dietary intake to compensate for this, Henry actually ate more possibly as comfort eating. Apart from the pain arising from his chronically infected leg ulcer, he was likely to have been frustrated at his own aging body, especially as he had been so athletic in his youth. The features in the 1540 portrait are congruent with the earlier portraits, though slightly buried in his bloated face, but the nose is of some concern as there is a distinct asymmetry (check the original) on the left side of the nose (the left side as you look at it). I am also surprised that the weight seemed to go on his nose as much as anywhere else. That the tip got slightly bulbous, is not surprising as he is likely to have been drinking as heavily as he was eating. Although a bulbous nose can be associated with rosacea, as this didn’t seem to be a feature of his appearance until his late 40s, it seems more likely that this was associated with alcoholic over indulgence. In none of his later portraits is the nose tip shown as red or asymmetrical but I’m sure Henry’s portrait painters did what they did for his daughter: in his old age he was painted in a flattering light. There are certainly some traits shown in the later portraits which were highly unlikely to represent how he really was and were therefore designed to flatter. The formal later year portraits, modelled after the Whitehall mural, show a standardised and flattering image. One example is the Petworth House portrait from the studio of Hans Holbein the Younger (and which probably dates between 1543 and 1547 – see the original at http://www.luminarium.org/renlit/henry8petworth.jpg) . Hans Holbein himself died in 1543. Henry, by then, was over fifty and had become very obese and was very unhealthy. But the portrait shows toned calves, of which Henry had been so proud when he was younger, and neat ankles. His weight, immobility, and poor circulation in his legs (especially suggested by the leg ulcer) mean that those attributes were a fiction by that time – memories of how he used to be. The Petworth House portrait also seems to have slimmed down the thigh on the right hand side of the portrait as it is not appropriately sized to go with the huge calf below it. The hair is shown as grey, a nod to Henry’s greater age, but Henry would not have gone grey (see my note above) and is likely to have been totally white by then. There is little sagging shown in his face and he is shown with quite a healthy, even, fresh and pale complexion. His nose is even, if broad, and the problem hinted at in the 1540 portrait is not included despite the fine quality of this portrait. So, as far as I can work out, in 1509 Henry was tall (6 foot 2 inches or 1.88 metres), reasonably slim and toned as he was very athletic. As a teenage boy, whose household had been under the ultimate control of his parsimonious father and austere grandmother, he was probably as slim on his accession to the throne as he ever would be. The Venetian ambassador in 1515 (six years later) wrote that he was “the handsomest potentate” and had a “a round face so very beautiful that it would become a pretty woman”. This was probably due to his neat, regular features that were almost delicate in their smallness and set off in fresh healthy skin over a good bone structure. In 1519 the then Venetian ambassador said that “He is much handsomer than any other sovereign in Christendom”. Together with his thick bright coppery gold wavy hair and bright blue eyes, these features all led to a very pleasing appearance when Henry was young. At the time he was considered better looking than the elegant, but big nosed, Francis (Francois) I of France who was too dark for the beauty standards of the time. He was also considered better looking than his nephew Charles (Carlos) V of Spain (and of the Holy Roman Empire) but Charles had inherited the unfortunate Hapsburg jaw of his father’s family. But, in the end, Henry’s delicate features and fine bone structure would end up buried under excess fat in old age, his eyes hooded in suspicion. His facial features would possibly even be distorted towards the end of his life through illness and/or overindulgence (see the discussion on his nose above). His slim athletic body would turn into a bloated, suppurating and immobile mess. The handsome chivalrous young king turned into the more familiar bloated tyrant hinted at by the post Whitehall mural portraits. 5. From page 45: Bolland, C. And Cooper, T., 2014, The Real Tudors: Kings and Queens Rediscovered, London: National Portrait Gallery Publications.